Tirana (Albanian: Tiranë; regional Gheg Albanian: Tirona) is the capital and largest city of Albania as well as heart of Albania's cultural, economic and governmental activity. It is located on the western center of the country surrounded by hills with the Dajti Mountain on the east and a slight valley opening on the north-west overlooking the Adriatic Sea in the distance. The city is located some 700 kilometres (430 miles) north of Athens, 290 km (180 mi) west of Skopje, 250 km (160 mi) south-east of Pristina and 160 km (99 mi) south of Podgorica. Tirana was founded as a city in 1614, although the area has been continuously inhabited since antiquity. One of the ancient monuments, the Tirana Mosaic is believed to have been part of a 3rd-century Ancient Roman house. Later, in the 5th and 6th centuries, a Paleo-Christian Basilica was built around this site. Tirana did not attain much significance until the early 20th century, when the Congress of Lushnjë proclaimed it Albania's capital following the country's declaration of independence in 1912. Tirana is the largest city in Albania and one of largest cities in the Balkans, ranking 7th, with a population of 800,000. The city is ranked among the ten sunniest cities in Europe, with 2,544 hours of sun per year. 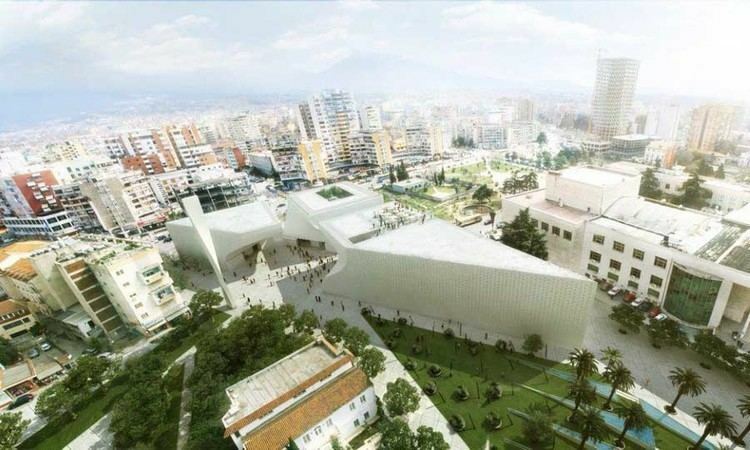 Being Albania's primate city, Tirana is considered the heart of Albania because of its central location and its importance in finance, commerce, media, entertainment, arts, international trade, education, service, research and healthcare. Almost all of the country's largest companies, media and scientific institutions have their headquarters in the city. Tirana is also the seat of power of the Government of Albania, the residences for work of the President and the Prime Minister of Albania. Tirana retains Roman and Byzantine monuments, as well as a number of Ottoman monuments. The oldest discovery in downtown Tirana was a Roman house, later transformed into an aisleless church with a mosaic-floor, dating to the 3rd century A.D., with other remains found near a medieval temple at Shengjin Fountain in the eastern suburbs. A castle possibly called Tirkan or Theranda, whose remnants are found along Murat Toptani Street, was built by Emperor Justinian in 520 A.D. and restored by Ahmed Pasha Toptani in the 18th century. The area had no special importance in Illyrian and classical times. In 1510, Marin Barleti, an Albanian Catholic priest and scholar, in the biography of the Albanian national hero Skanderbeg, Historia de vita et gestis Scanderbegi Epirotarum principis (The story of life and deeds of Skanderbeg, the prince of Epirotes), referred to this area as a small village. Records from the first land registrations under the Ottomans in 1431–32 show that Tirana consisted of 60 inhabited areas, with nearly 2,028 houses and 7,300 inhabitants. Tirana is mentioned since 1572 as Borgo di Tirana. In 1614, Sulejman Bargjini, a local ruler, built the Old mosque, a small commercial centre, and a hammam (Turkish bath). During this period, the Et'hem Bey Mosque, built by Molla Bey of Petrela, was constructed. It employed the best artisans in the country and was completed in 1821 by Molla's son Etëhem, who was also Sulejman Bargjini's grandnephew. In 1800, the first newcomers arrived in the settlement, the so-called ortodoksit. They were Vlachs from villages near Korçë and Pogradec, who settled around modern day Park on the Artificial Lake. They started to be known as the llacifac and were the first Christians to arrive after the creation of the town. After Serb reprisals in the Debar region, thousands of locals fled to Tirana. In 1807, Tirana became the center of the Sub-Prefecture of Krujë-Tirana. After 1816, Tirana languished under the control of the Toptani family of Krujë. Later, Tirana became a Sub-Prefecture of the newly created Vilayet of Shkodër and Sanjak of Durrës. On 8 February 1920, the Congress of Lushnjë proclaimed Tirana as the temporary capital of Albania, which had gained independence in 1912. The city retained that status permanently on 31 December 1925. In 1923, the first regulatory city plan was compiled by Austrian architects. 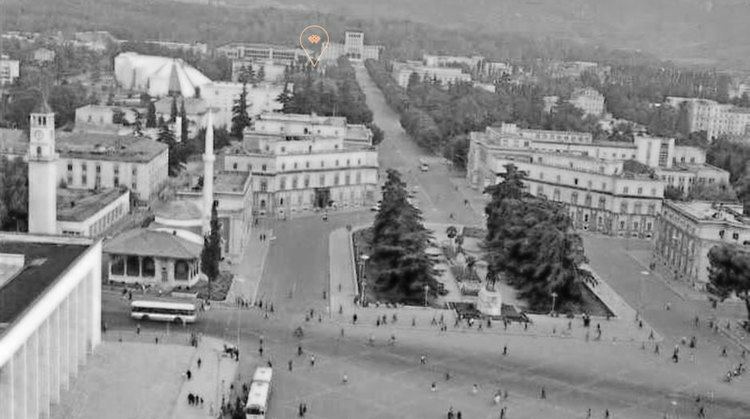 The centre of Tirana was the project of Florestano Di Fausto and Armando Brasini, well known architects of the Benito Mussolini period in Italy. Brasini laid the basis for the modern-day arrangement of the ministerial buildings in the city centre. The plan underwent revisions by Albanian architect Eshref Frashëri, Italian architect Castellani and Austrian architects Weiss and Kohler. Modern Albanian parliamentary building served as a club of officers. It was there that, in September 1928, Zog of Albania was crowned King Zog I, King of the Albanians. Tirana served as the venue for the signing, between Fascist Italy and Albania, of the Pact of Tirana. In 1939, Tirana was captured by Fascist forces appointing a puppet government. 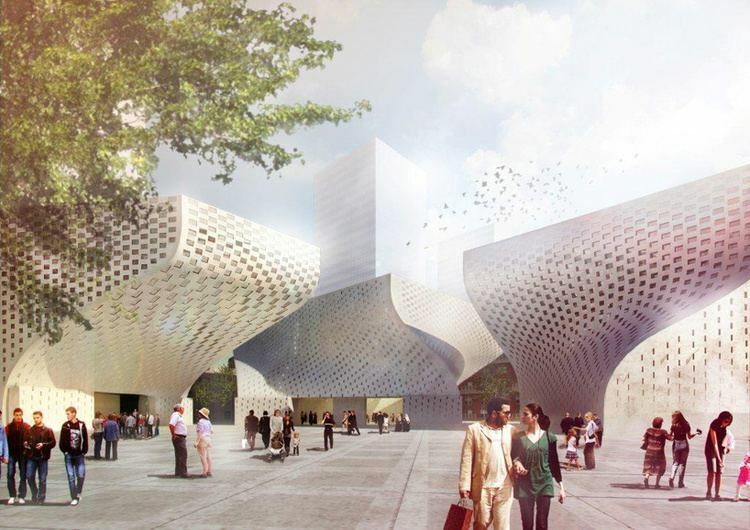 In the meantime, Italian architect Gherardo Bosio was asked to elaborate on previous plans and introduce a new project in the area of present-day Mother Teresa Square. A failed assassination attempt was made on Victor Emmanuel III of Italy by a local resistance activist during a visit in Tirana. In November 1941, two emissaries of the Communist Party of Yugoslavia (KPJ), Miladin Popović and Dušan Mugoša, managed to call a meeting of three Albanian communist groups and founded the Communist Party of Albania, of which Enver Hoxha would shortly emerge as the leader. The town soon became the center of the Albanian communists, who mobilized locals against Italian fascists and later Nazi Germans, while spreading ideological propaganda. On 17 November 1944, the town was liberated after a fierce battle between the Communists and German forces. The Nazis eventually withdrew and the communists seized power. From 1944 to 1991, massive socialist-styled apartment complexes and factories began to be built, while Skanderbeg Square was redesigned with a number of buildings being demolished. For instance, Tirana's former Old Bazaar and the Orthodox Cathedral were razed to the ground for the erection of the Soviet-styled Palace of Culture. The northern portion of the main boulevard was renamed Stalin Boulevard and his statue was erected in the city square. Because private car ownership was banned, mass transportation consisted mainly of bicycles, trucks and buses. After Hoxha's death, a pyramidal museum was constructed in his memory by the government. Prior to and after the proclamation of Albania's policy of self-imposed isolationism, a number of high-profile figures paid visits to the city, such as Soviet leader Nikita Khrushchev, Chinese Premier Zhou Enlai and East German Foreign Minister Oskar Fischer. In 1985, Tirana served as the ceremonial venue of Enver Hoxha's funeral. A few years later, Mother Teresa became the first religious figure to visit the country following Albania's long declared anti-religious atheist stance. She paid respect to her mother and sister resting at a local cemetery. Starting at the campus and ending at Skanderbeg Square with the toppling of Enver Hoxha's statue, the city saw significant demonstrations by University of Tirana students, demanding political freedoms in the early 1990s. Starting in 2000, former Tirana mayor Edi Rama (mayor from 2000 to 2011) under the Ilir Meta government, undertook a campaign to demolish illegal buildings around the city centre and along the Lana River banks to bring the area to its pre-1990 state. In an attempt to widen roads, Rama authorized the bulldozing of private properties so that they could be paved over, thus widening streets. Most main roads underwent reconstruction, such the Ring Road (Unaza), Kavaja Street and the main boulevard. Rama led the initiative to paint the façades of Tirana's buildings in bright colours (known as Edi Rama colours – very bright pink, yellow, green, violet) although much of their interiors continued to degrade. Rama's critics claimed that he focused too much attention on cosmetic changes without fixing any of the major problems such as shortages of drinking water and electricity. A richer calendar of events was introduced and a Municipal Police force established. In the 2015 municipality election, power was transferred from the Democratic Party representative Lulzim Basha, to the Socialist Party candidate Erion Veliaj. The country underwent a territorial reform, which unified communes with municipalities leaving 61 of them. Thirteen of Tirana's communes were integrated as administrative units joining the existing eleven. Since then, Tirana is undergoing major changes in law enforcement and new projects as well as continuing the ones started by his predecessor. In their first few council meeting 242 social houses got allocated to needing families. 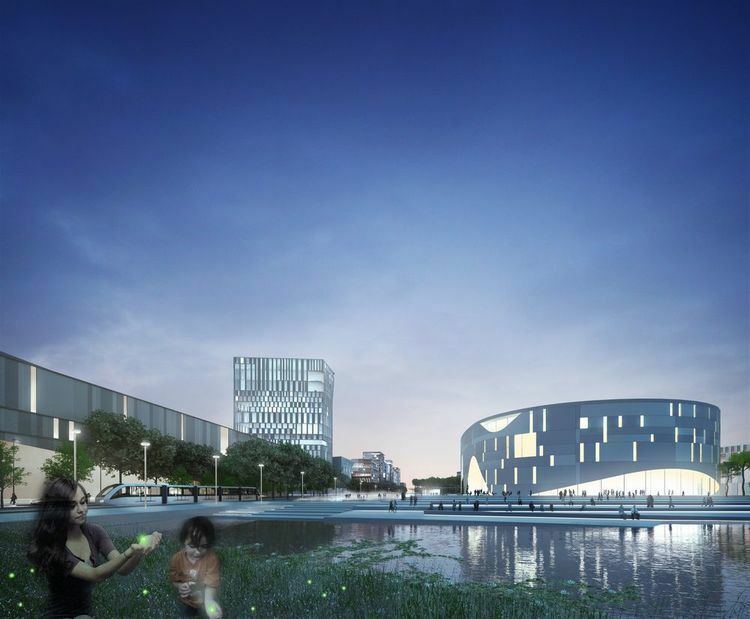 Construction permits were suspended until the capital's development plan is revised and synthesized. In addition the municipality will audit all permits granted in the previous years. Tirana lies on the boundary between Zone 7 and Zone 9 in terms of the hardiness zone. In September 2015, Tirana organized its first vehicle-free day, joining forces with numerous cities across the globe to fight against the existing problem of urban air pollution. This initiative resulted in a considerable drop in both air and noise pollution, encouraging the Municipality to organize a vehicle-free day every month. According to a 2016 report published by the National Environmental Agency, air pollution in Tirana dropped by 15%, compared to the previous year. The city suffers from problems related to overpopulation, such as waste management, high levels of air pollution and significant noise pollution. Over the last decades, air pollution has become a pressing concern as the number of cars has increased. These are mostly 1990s and early 2000s diesel cars, while it is widely believed that the fuel used in Albania contains larger amounts of sulfur and lead than in the European Union. Another source of pollution are PM10 and PM2.5 inhaled particulate matter and NO2 gases resulting from rapid growth in the construction of new buildings and expanding road infrastructure. Untreated solid waste is present in the city and outskirts. Additionally, there have been complaints of excessive noise pollution. Despite the problems, the Grand Park at the Artificial Lake has some effect on absorbing CO2 emissions, while over 2.000 trees have been planted around sidewalks. The work of four new parks has started in the summer of 2015 located Kashar, Farkë, Vaqarr, and Dajt. These parks are part of the new urban plan striving to increase the concentration of green spaces in the capital. The government has included designated green areas around Tirana as part of the Tirana Greenbelt where construction is not permitted or limited. Tirana has been proclaimed as the capital of Albania eight years after the independence of the first Republic in 1912. The Congress of Lushnjë proclaimed Tirana as the capital of the nation in 1912. The first regulatory city plan was compiled in 1923 by Austro-Hungarian architects. Afterwards, the city center of Tirana was designed by Italian architects such as Florestano Di Fausto, Gherardo Bosio and Armando Brasini. However, Tirana continued with its status as the political and cultural centre of the country, being home to all the national institutions that includes the Government, the Parliament, the Ministries, the Presidential Palace, the judicial bodies and other political institutions. Being the capital of Albania, Tirana is the seat of the Government of Albania. The two chief officers have their official residences and offices in the city. The President of Albania, resides at the Presidential Palace, while his office is the Presidential Office. The workplace of the Prime Minister of Albania, is the Prime Minister's Office. The nation's highest courts are based in Tirana such as the Supreme Court, the Constitutional Court, the Court of Appeal and the Administrative Court. Tirana is also home to more than 45 embassies and representative bodies as an international political actor. The Municipality of Tirana is divided into 24 administrative units referred to as Njësi Bashkiake or Administrative. These have their own appointed mayor and council, and sometimes known as Mini-Bashki. Tirana is the most populous city in Albania and one of the largest in the Balkan peninsula. It is also Albania's only metropolitan area with a population of over 800,000. The city is home to many ethnicities from all over the Balkans. About 630.203 (84.10%) of the population are Albanians, 2.596 (0.35%) Greeks, 856 (0.11%) Aromanians 513 (0.07%) Macedonians, 198 (0.03%) Italians. 1.042 (0.14%) did not declare their ethnicity. At the 2011 census, the urban areas of the city include 526.017 people. The rural areas of Tirana County, which are known as the suburbs of Tirana, include 223.348 people. Altogether, the figure for the whole county is counted as 749.365 people. The number of women slightly exceeds the number of men in the county, with 370.587 men, and 378.778 women. Muslims (including the large Bektashi minority in Albania) make up about 65% of Tirana's population. About 11% of the population identify as some denomination of Christians, 3% are Atheists and 4% identify themselves as believers without denomination. An interesting fact in the religious make up of Tirana, is the 15% (113.000 people) who preferred not to answer the survey question. This hesitance to not answer may come from the era of the Communism in Albania under dictator Enver Hoxha, where he famously proclaimed: The only religion for an Albanian is Albanianism, declared Albania as an atheist state and attempted to remove all organized religion from the country. The Roman Catholic Church is represented in Tirana by the Archdiocese of Tiranë and Durrës, with the St Paul's Cathedral the current seat of the prelacy. The Albanian Orthodox community is served by the Archbishop of Tirana in the Resurrection Cathedral. The healthcare system in Albania is mainly public. The private healthcare sector in Albania is still developing, and it covers most of the pharmaceutical and dental services mainly being situated in Tirana. The largest hospital in Tirana is Mother Teresa Hospital, which is associated with University of Tirana, Faculty of Medicine. A number of private hospitals have been opened. The economy of Tirana is dominated by the service sector with around 68.5%, the industrial sector by 26.1% and argiculture sector with 5.4%. The city began to develop at the beginning of the 16th century, when a bazaar was established, and its craftsmen manufactured silk and cotton fabrics, leather, ceramics and iron, silver, and gold artefacts. Today, Tirana and Durrës forms the financial and business heart of country. However, important economic sectors in Tirana include transportation, information and communication technologies, media, advertising and design, environmental services, construction, e-commerce, banking, legal services, retail, hotel business, and medical engineering. Tirana is home not only to almost all national institutions and government agencies, but also to many domestic and international companies such as the mineral AlbChrome), the petroleum Taçi Oil, the technology Albtelecom, Vodafone, Telekom Albania, the banking Central Bank, Raiffeisen Albania, Banka Kombetare Tregtare, American Bank of Albania, Credins Bank, Tirana Bank, electronic Neptun and many other companies. The ABA Business Center, TID tower and the 4 Ever Green Tower, were being constructed in the city. Tirana has malls, such as Citypark, QTU, Toptani and Tirana East Gate. Stocks are traded at the Tirana Stock Exchange. Furthermore, the Tirana Logistic Park and Tirana Business Park are currently under construction. Tirana is served by Tirana International Airport Nënë Tereza named after the Albanian Roman Catholic nun and missionary Mother Teresa. It is the only port of entry for air travelers to the country. The airport is located in the village of Rinas 6 nautical miles (11 kilometres; 6.9 miles) northwest of the city centre of Tirana. The city serves as the meeting point for national roads SH1, SH2 and SH3. Construction of the outer big ring highway started in 2011. National Road 1 (SH1) leads to the Albanian – Montenegrin border at Hani i Hotit border crossing. From Tirana at the Kamza Overpass (Mbikalimi i Kamzës) northward, it passes through Fushë-Kruja, Milot, Lezha, Shkodra, and Koplik. Between Thumane and Milot, the SH1 has become part of the Albania – Kosovo Highway connecting the capital Tirana with Kosovo. SH1 forms part of the Albanian North-South Corridor connecting Hani i Hotit border with Kakavijë in the Albanian – Greek border thus forming part of the Adriatic-Ionian motorway. National Road 2 (SH2) is a dual carriageway in Albania linking the port city of Durrës with Tirana. SH2 begins at the Port of Durrës in Durrës at the Dajlani Overpass, bypasses Shijak, intersects with SH52 in Vora, bypasses the road to Tirana International Airport, and ends at the Kamza Overpass in the outskirts of Tirana where it meets National Road 1 State Road heading to northern Albania. The Albanian Motorway A3 it is planned to run along the central corridor of Albania from Tirana to southern Albania, whose first part is the Tirana–Elbasan Highway connecting Tirana with the Pan-European Transport Corridor VIII. The section from Tirana to Elbasan, will be an alternative to the old curvy road SH3 along Krraba Pass. The new highway bypasses the heavy traffic via Durrës-Rrogozhina. In addition, the new track about 15 kilometres (9.3 miles) shorter than the path to the SH3, resulting in drastically reduced distance with much higher speed between Tirana and Elbasan. Economically, after completion it will be an important link between the Albanian capital and Greece. In recent years, in anticipation of the construction of the new Multi-Modal Terminal near the Kamza Overpass at the entrance of Tirana, the Municipality of Tirana has opened several temporary bus terminals mainly along Dritan Hoxha St and Student City to regulate the chaos of public transport between towns in Tirana. These terminals serve Southern and Southern Albania including Durres, and Kosovo and International bound coaches. The city of Tirana is served by the Port of Durrës, one of the largest passenger port in the Adriatic Sea, 36 km (22 mi) distant from the city. Passenger ferries from Durrës sail to Dubrovnik, Zadar (Croatia), Corfu (Greece), Ancona, Bari, Brindisi, Genoa, Otranto, Trieste (Italy), Bar (Montenegro), Koper (Slovenia) and other cities in the region. Local transport within Tirana is by bus or taxi. Official taxis have yellow plates with red text and usually use taximeter. Coach and minibus (furgon) services also run to the coast and northern and southern Albania from Tirana. International coach services connect to Greece, via Korçë or Kakavije, to Kosovo via the new Durrës-Morine highway, and to the Republic of Macedonia via Struga. The Ecovolis bicycle sharing system was launched in 2011. Bicycles are rented from initially four stations located at Rinia Park and along Deshmoret e Kombit Boulevard. A full day ride costs 100 leks. Bike only lanes are located alongside existing sidewalks on Skanderbeg Square, Lana River and Kavaja Street, while combined bus and bike lanes are located on other main streets to alleviate overall congestion. Tirana is home to different architectural styles that represent influential periods in its history dating back to the antiquity. The architecture of Tirana as the capital of the country, was marked by two totalitarian regimes, by the fascist regime of Benito Mussolini during the World War II and the communist regime. Both have left their mark on the city with their typically architecture. In addition to the objects of the architecture of the totalitarian regimes of the 20th century, Tirana offers a couple of other such objects of both periods. The Palace of Brigades (former Palace of the Albania's King Zog I), the ministries buildings, the government building and the municipality hall are designed by Florestano Di Fausto and Armando Brasini, both well-known architects of the Mussolini period in Italy. The Dëshmorët e Kombit Boulevard was built in 1930 and given the name King Zog I Boulevard. In the communist period, the part from Skanderbeg Square up to the train station was named Stalin Boulevard. The Royal Palace or Palace of Brigades previously served as the official residence of King Zog I. It has been used by different Albanian governments for various purposes. Because of the outbreak of World War II, and the 1939 Italian invasion of Albania, King Zog I fled Albania and never had a chance to see the Palace fully constructed. The Italians finished it and used it as the Army Headquarters. The Palace took its nickname Palace of Brigades because it was taken from the Italians by a people army brigade. In the 21th century, Tirana turned into a proper modernist city, with large blocks of flats, modern new buildings, new shopping centres and many green spaces. 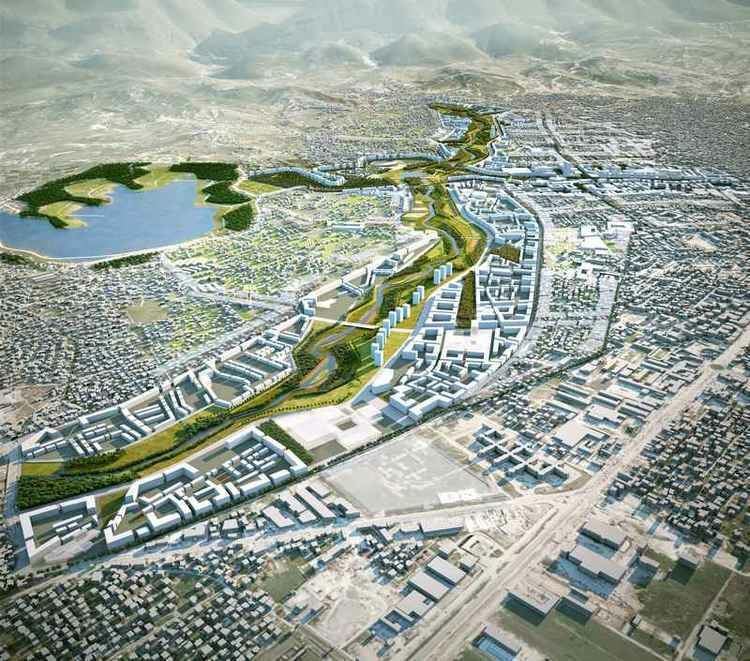 In June 2016, the Mayor of Tirana Erion Veliaj and the Italian architect Stefano Boeri announced the start of the works for the redaction of the Master Plan Tirana 2030. The Rinia Park was built during the Communist regime in Albania. It bordered by Dëshmorët e Kombit Boulevard to the east, Gjergi Fishta Boulevard and Bajram Curri Boulevard to the south, Rruga Ibrahim Rugova to the west and Rruga Myslym Shyri to the north. The Taivani Center is the main landmark in the park and houses cafés, restaurants, fountains, and a bowling lane in the basement. The Summer Festival takes place every year in the park, to celebrate the end of winter and the rebirth of nature and a rejuvenation of spirit amongst the Albanians. As of the current Mayor of Tirana Erion Veliaj, the Municipality of Tirana will built more green spaces and will plant more trees. In recent years, Tirana is becoming a popular hub for events. Festivals are one of several things that people in Tirana enjoy well. It has a large number of festivals and events. The diversity of festivals makes it possible for people of different tastes to find themselves in a city this small. Festivals in the city provide entertainment for the youth as well as for adults. The Summer Festival takes place every year on March 14, celebrating the Spring Day (Albanian: Dita e Veres), the country's largest pagan festival. It is widely celebrated in Tirana and as well as in other cities in Albania and the Arbëresh colonies in Italy. Another major event, the Tirana International Film Festival takes place in Tirana each year, which brings a large number of artists to produce a wide range of interesting film works. Other festivals include the Tirana Jazz Festival, the Guitar Sounds Festival, the Albanian Wine Festival and more. In 2016, the first Telekom Electronic Beats Festival were held in Tirana, bringing the latest trends from the urban lifestyle to the Albanian youth. This is the effort of Tirana to increase the number of tourist visits. However, the city is become a popular destination for many young people around the region during the vacation period.